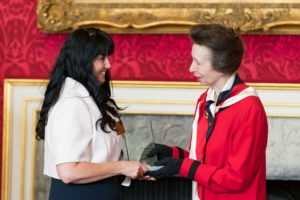 15 March 2018, St James’s Palace, London: The Butler Trust’s 33rd Annual Award Ceremony, hosted by HRH The Princess Royal, took place on 15 March, in the State Rooms at St James’s Palace. The Princess presented 11 Awards and 19 Commendations to a total of 33 staff members and volunteers from prison and community justice settings throughout the UK, and among the 200 guests from across the criminal justice sector were: Secretary of State for Justice, David Gauke; Minister for Prisons and Probation, Rory Stewart; Chief Executive of HMPPS, Michael Spurr; Heads of the Scottish and Northern Ireland Prison Services, Colin McConnell and Ronnie Armour; and the Head of the Youth Justice Board, Colin Allars. This year’s Princess Royal’s Prize for Outstanding Achievement (the highest Award) went to volunteer counsellor, Eileen Whittaker, for her exceptional contributions at HMP Styal. Described by her Governor as ‘exceptional’, she wins an Award for the outstanding support she has provided, over many years, to both prisoners and staff, and for developing a network of volunteers which now delivers over 50 hours of counselling each week.